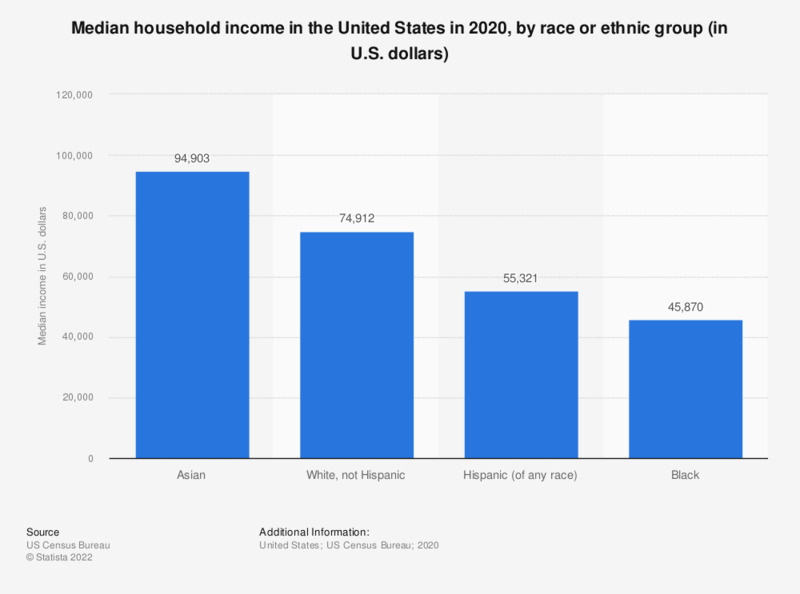 The statistic shows median household income in the U.S. in 2017, by race or ethnic group. Real median household income for Asian households stood at 81,331 U.S. dollars. Median household income in the United States, of all racial and ethnic groups, came out to 56,516 U.S. dollars in 2016. Asian and Caucasian (white not Hispanic) households had relatively high median incomes, while Black and Hispanic households both came in lower than the national average median income. A number of related statistics illustrate further the current state of racial inequality in the United States. Unemployment is the highest among Black or African American individuals in the U.S. with 8.5 percent unemployed, according to the Bureau of Labor Statistics in 2016. With 8.4 percent unemployment, Americans of Dominican ethnicity ranked second in unemployment that year. Hispanic individuals (of any race) were most likely to go without health insurance as of 2016, with 19.3 percent uninsured.